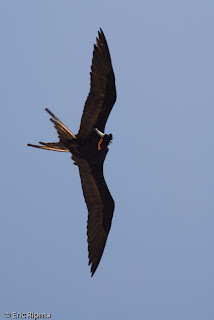 A Magnificent Frigatebird preening while on the wing. Did you know? . 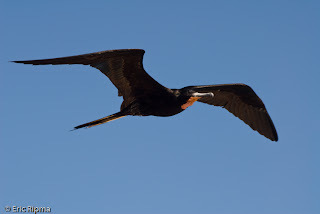 . . that Magnificent Frigatebirds have a long period of immaturity. Young frigatebirds receive up to a year or more of parental care. So unlike most birds, adult Magnificent Frigatebirds don't breed every year because they spend so much time raising their young. The young birds do not reach breeding maturity until 8-10 years of age and it takes that long for young birds to attain their adult plumage. There is only one known breeding colony in the US which is in the Dry Tortugas of Florida. Worldwide, they breed from Ecuador and Brazil up to Baja, California and throughout the Caibbean. They also breed off the coast of Africa.